Sgt. John Picard, Sgt Michael Scaramuzzo, Patrolman Jeff Galligan and Patrolman Bobby Brown (left to right) of the North Providence Police department, take donates at heir annual “Stuff a Cruiser” event. The drive, held in Partnership with Stop & Shop and Shaw’s, collects food to provide Thanksgiving meals to those in need. Proceeds benefit local schools, churches and food shelters. The event was held at the Mineral Spring Avenue Stop & Shop on Saturday. Dottie Leach of North Providence (left) delivers a donation to North Providence Police Patrolman Jeff Galligan (right) at the annual “Stuff a Cruiser” event. The event was held at the Mineral Spring Avenue Stop & Shop on Saturday. 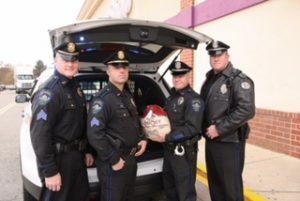 Patrolman Jeff Galligan (left) Patrolman Bobby Brown (center) and Sgt Michael Scaramuzzo (right) load turkeys into the back of their car during the North Providence Police Department’s “Stuff a Cruiser” event. Scaramuzzo was the organizer of the food drive. The event was held at the Mineral Spring Avenue Stop & Shop on Saturday.